The nyckelharpa (which translates as keyed-fiddle) is an instrument that is fast gaining hold in the UK. From just a hand full of players in 2000s we are now increasing in number. The society began as a core group keeping in contact via Yahoo and has now moved to a more formal group. 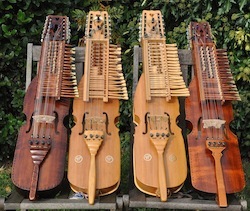 The UK Nyckelharpa Society is a non-profit group of like minded people intent on playing as much music as possible. We have regular meetings around the country and are currently building up an allspel list. We have lots of ideas of how to take the instrument forwards – the society and the allspel list being the first two.The society is run on good will and volunteers, currently the site is free. There are not many teachers or resources for the nyckelharpa in the UK, so the aim of the society is to help with information and instruments. If you know of a person or a workshop in your area let us know so we can update the links. Have a look around and get in touch, better still join up! It's free. Join us!